What an Incredible Class of 2017! As Father’s Day approaches, it makes us think about the role models who made the difference in our lives. The power of one strong adult relationship is a key ingredient in resilience and can change a child’s life forever. A kind word, a nod of encouragement, an honest conversation over a meal – these seemingly small moments can be lifechanging for our children and youth in foster care. They say to a young person, “I BELIEVE IN YOU”. It’s extraordinary to see what a child can do when they know they have the support of our healing community. 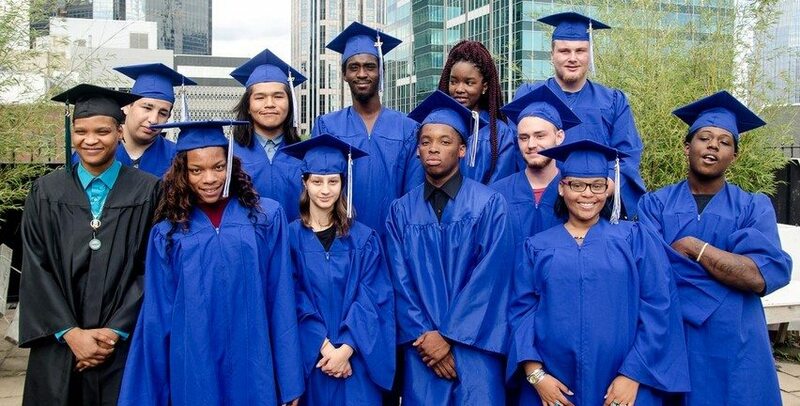 8 of our youth in Independent Living graduated from local high schools. 9 young people earned their HSE (High School Equivalancy) Credential through our Youth Connections program. Timothy (top, center) qualified for the Hope Scholarship. 1 youth, Passion, (far left) graduated from College at Nashville State. Future plans for our graduates include attending Chattanooga State, Vol State, Nashville State, TCAT and the University of Tennessee. Congratulations to all our graduates and a big thanks to the LP Corporation for sponsoring our celebration!